Linistepper: Smooth, Fast, STRONG, and Cheap driver using a PIC! 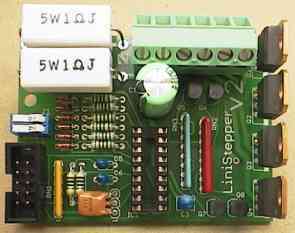 The Linistepper is a well reviewed, open source controller / driver for small to medium sized 5, 6 or 8 wire unipolar (not 4 wire bi-polar) stepper motors. The Linistepper combines ultra smooth, low noise, old school linear microstepping with modern active current regulation for faster response. The kit is easy to build, hard to damage, and easy (and cheap) to repair. Fully documented: how it works, how to use it, how to troubleshoot problems and get your motors running! Drive up to 3 amps* at 36 volts for over 100 watts of power: Enough to move a 15lb axis at 60IPS or a 30lb load at 30IPS! * requires 2 sets of tuning resistors and a fan heatsink. Easily connect up to 7 units to a parallel port. Standard 3 or 4 axis setup wtih our BOB. Faster clock speed supports higher step pulse rates. These well made kits are easy to assemble with your soldering iron. Hard to break, easy to repair (new drive transistor set less than $2), smooth and cheap! 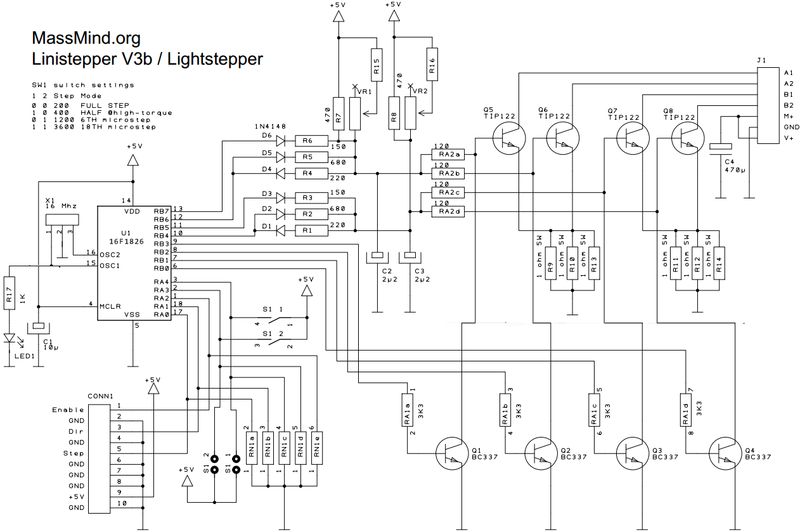 If you are driving up to 3 amps on low cost unipolar steppers, nothing beats a Linistepper. Mariss Freimanis of geckdrive.com says: "A switching type drive makes sense when the power levels are large. The inefficiency of a linear drive becomes prohibitive at such levels. At 7A and 80V, a classic linear drive dissipates an unacceptable 560 Watts of heat in the power transistors. Although they are excellent drivers, purchasing a set of three Geko G250 ( 3.5A * 50VDC / $81 = 2.16 ) for $243 is still a waste of money if you are driving smaller motors. The Linistepper will cost you $90 for 3 axis plus your time assembling the kit and has a 2A * 35V / $30 = 2.33 "Mariss rating". Geko's are the best drivers in the industry for large bipolar motors at ultra high (>1000 rpm) speeds. If you are running anything up to a couple amps, the Linistepper and your soldering iron will give you close to the same performance (smooth, low resonance, best torque) at half the price with motors you pulled from a printer, fax or copier, or purchased used or on the cheap. PCB and full kit of parts to build your own! You supply voltages, heat sink & mounting bracket, unipolar stepper motor, and step/direction signals. Just about anywhere in the world! Also available: Printed Circuit Boards! These are VERY well made boards and are certainly worth the price IF you have a well stocked scrap box to populate them and a PIC programmer. However, you will find our kit price for complete kits is MUCH LESS than the cost of parts and PCBs, AND the PIC comes already programmed! USA only! Can't be made for less! - 5 volt regulated supply. Perfect for connecting up to 4 Linisteppers to your PC for CNC operation! * This are electronics KITs, you need to solder them together. BTW to all those newbies out there Linisteppers impressed me as a newbie but then they were starting to show their weakness - they were sloooow. At least I thought it's due to linisteppers. Well, I can report that with 24v and laserjet steppers these things are SCREAMING!!! I'm running them nicely at 20revs/sec (albeit 1 minute at a time, until I've sorted out my cooling problems) with my very rough machine that hasn't been executed too precisely or adjusted properly. Before at 12v the motors would stall at the slightest misalignment and 6revs/sec was all I could get out of them reliably. Once all that is ironed-out I'm thinking 30revs/sec (1.75mm lead) would be attainable. [The Linisteppers] only deficiency, it seems, is the transistor heat. I have a chopper here and a linistepper and they both run at 24v. Linistepper "sounds" sweeter and it seems it runs faster as well before stalling. This is strange as I always thought a chopper would go faster and stall higher up in the rev range. I don't know what I like better, burning my finger on the driver board or burning my finger on the motor. Which do you prefer? P.S. it seems that once I switched to a chopper driver all that heat that used to be on linisteppers just transferred to motors themselves! Since I burned my fingers on a motor that was driven by a chopper (and that motor was actually HOTTER than linisteppers driving other motors) I have decided to stick to linisteppers. It's easier to worry about heat in one place than 3 separate locations. Went down to my local PC shop and they'll have some 2nd hand pentium II coolers with fan in by monday. Ok, I have re-assembled one of my linis, applied thermal paste, applied isolators to each, mounted the brackets and laid a 12v computer fan on the brackets blowing DOWN through the brackets and onto the lini. The lini transistors are now as cool as ice. Russell (epineh) says: "Fired up one of the boards today... that is one sweet driver on full microstepping! ... If I tried these drivers first I wouldn't have chosen to upgrade to servo's on my router... P.S. Did I mention that the motion was smooooth ?" Brian Gerber says: "with 118 oz inch motors and 1/4-28 threaded rod at 5 ipm I'm getting 50 pounds of force on the axis!" tommylight says: "I did try linisteppers and they work like a charm, i also have geckos and some other drivers, but for the money you won't find anything better than lini's ." i would highy reccomend you unit. thank you!" Brian Bartholomew says: "My compliments on the high quality of the kits! I can't imagine how you do it at that price, but I am thrilled that you do." Chad Richardson says: "I like your Linistepper control boards. I think the quality is great and the price is very nice as well. The kits are a really good value." Suggestion: Make a note of the changed capacitor values in the printed instructions. Request 1: Make a bipolar controller next! (3 or 4 wire) Please! Request 2: Offer or specify "upgrade kit" with *specific* directions of what to change, for higher amp motors (for people like me who don't know what they're doing). Compliment: Very professional looking. I'm sure I'll be pleased with the performance, when I finally finish one. Bipolar controllers are inherently more expensive (4 times the power transistors) and less attractive in a hobby market. Mike Henry says: " I have just recieved the package of 4 linistepper kits. Thanks. verry much. They were 2 days earlier than I expected. I am going to be out of Town on bussiness and have decided to leave a careful examination of the bits and pieces till I return on Monday. However , I have looked at them and they look very professional . You and your associates can rightly be proud of the Kit." Sam Colwell sent pictures of his CNC machine. "Thanks again for your linistepper kits. They were a pleasure to construct and use, and your documentation is excellent." John Zeigler of johnstelescopes.com and mirrorkits.com I received the three board kits in the mail a few days ago, and I was very impressed with the quality of the kit and circuit board. Karl Friend says: "Holy smokes was that a fast delivery - even for the USPS! I have never ordered something online and received it in 2 business days... ...Everything looks good, and the PCB is of a professional level." Received your kit today (saturdaymorning 9 Nov.) Thank you Verry Much! Norbert says: "I GOT ALL THREE BOARDS RUNNING AND THEY WORK ABSOLUTELY MARVELLOUSLY. PLEASE ACCEPT MY COMPLIMENTS FOR THIS EXCLLENT TECHNOLOGY." Vince Negrete says: "Hi James, Just got the kits after 2pm today, thank you for not delaying shipping. I was worried since I never heard back from you after payment. Thanks man. Nice kit.!" John Papin says: "Just to let you know I received your boards. Thanks again. Really nice work. " Martjin Mulder says: "Hi James, I did some homework, i will order the bare boards, program the pic proccessor ... and snif in the [junkbox for parts]... Thanks for youre support so far ! I'll order the boards right away." Hugh says: "Thank YOU very much - nice package for hobbyists -"
My Linistepper is rotating in random directions when pulsed. The voltage to pin 18 of the pic reads about 5.3v for forward, and about .25 for reverse. I think I might have a fried chip, and will swap it out, but is there anything else you can think of that might cause this? Thanks for any help you can offer.